Auckland is one of New Zealand’s major cities, and offers a great urban scene as well as plenty of natural beauty to admire. It’s an innovative and culturally diverse city, with 1/3 of the country’s population living there. 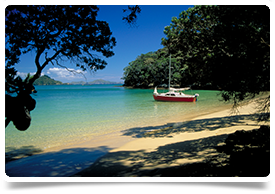 Auckland is home to some of New Zealand’s most beautiful nature; as it has forests, volcanic peaks, islands, harbours and beaches surrounding the city. It’s an excellent place to experience different terrains and all the fun they have to offer, with many places to do mountain biking, climbing, surfing, and snorkelling. 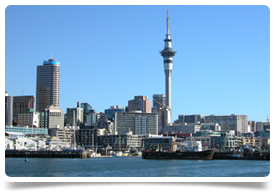 The Waitemata Harbour, more commonly known as the Auckland Harbour, is an iconic part of the city. Known as the ‘city of sails’, boats and super yachts fill the harbours. Take a ferry, boat cruise or kayak tour to fully experience the beauty of Auckland’s harbours and islands, and get the best view of the city. Known for its volcanic peaks, the Rangitoto Island can be climbed with an hours walk, with caves along the way and a spectacular view at the top. The Tiritiri Matangi Island is a wildlife sanctuary and is home to some of the local endangered species. Spot the kiwi birds, among the 80 species of birds living on the island as you follow the trails through the forest. Visit the oldest lighthouse in New Zealand and look out for nesting blue penguins while you’re there. The Waitakere Ranges are forest covered hills reaching 1,400 ft tall. Located just 30 minutes from the city centre, the ranges offer walking trails from a quick 45 minute walk to several days of hiking. Set off on a unique adventure in the Waitomo Caves; walk through the tunnels, see the illuminated Glow-worm Grotto and travel along the underground rivers down to the Waitomo Forest. Even more of the caves can be seen by abseiling and climbing them. Auckland is a vibrant city with many places for shopping and dining, with the Auckland Harbour being an ideal location because of its variety of cuisines and amazing views. Many restaurants boast locally sourced food and wine, for a true taste of Auckland. To get a real taste of the local wine head to Kumeu Wine Country or visit the Waiheke Island, for wine tours around the island. There are always local markets to peruse for delicious foods, as well as the fish market where you can buy for yourself, or watch others bid on the best catches. 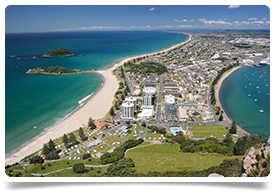 Seafood is particularly popular, with Devonport and Mission Bay hosting a variety of seafood restaurants in a seaside setting. One of the most well-known tourist attractions in Auckland is the Sky tower. At 1,076 ft tall, with 3 viewing platforms, it offers stunning views of the city. The tower is an iconic part of the Auckland skyline, and is the tallest building in New Zealand. To make your visit to the tower even more exciting, you can participate in the SkyWalk and walk around the outside of the tower or try the SkyJump and jump from 623 ft to the landing platform below for a real adrenaline rush! The Auckland Harbour Bridge is another major landmark, and also offers an impressive view of Auckland. To make the most of your visit to the bridge, you can climb up it and even bungee jump over the water! One of the largest parks in the city is the Auckland Domain, at the site of an erupted volcano, the park offers outdoor and indoor areas. Ideal for picnics and relaxed walks, the park includes the Wintergardens, Sensory Gardens, Duck Ponds, Gum Tree Hill and Auckland War Memorial Museum.